A genetic study of a remote population of wild horses in Western Canada has posed a raft of new questions about their origins, with the results revealing an intriguing link to the Yakut horses of Siberia. The preliminary study was conducted by equine geneticist Gus Cothron, from Texas A&M University, and biologist Wayne McCrory, of McCrory Wildlife Services. The research, backed by the Valhalla Wilderness Society, the Friends of Nemaiah Valley and the Xeni Gwet’in (Nemiah) First Nation Goverment, among others, centered on the population of horses in a remote area of British Columbia known as the Brittany Triangle, which is bounded to the west by Chilko Lake. There is widespread historic documentation that the common ancestral lineage of the wild horse in the Americas came from Spanish horses brought over from Spain in the early 1500s. 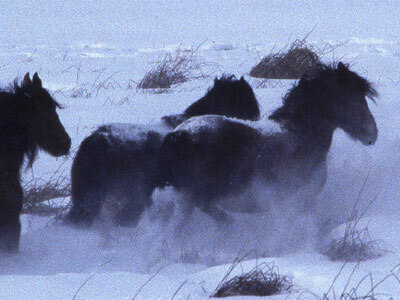 A small number of New World wild horse populations still maintain characteristics of their Spanish heritage, despite horses from other parts of Europe subsequently being introduced to North America. It has long been assumed that the horses observed by European fur traders in the early 1800s in the Chilcotin area in southern-central British Columbia had descended from this Spanish stock. They had probably arrived in the general area around 1740, based on research conducted into historical documents by others. Today, an estimated 1000 feral horses survive in remote areas of the Chilcotin Plateau, including an estimated 150-215 in the Brittany Triangle, which covers about 155,000 hectares. Cothran and McCrory said the semi-isolated Brittany population was likely the most remote herd left in mainland Canada, having survived for several centuries alongside major predators that include grizzly bears, mountain lions and grey wolves. The local First Nation tribe created a large preserve in 2002, which included the Brittany Triangle, to protect the horses, but have retained the right to capture them for domestic and work purposes. Triangle wild horses came from Spanish bloodlines, and to explore other ancestral genetic lineages. They first analysed eight blood samples collected in 2003 and 2004 from domestic ranch horses that had been captured wild in the Brittany Triangle. The results pointed to some probability of lines from horses on Europe’s Iberian Peninsula, and possibly Spanish ancestry, but this was considered preliminary because of the very small sample size. Following this, 99 viable hair samples were collected from the wild between 2006-2010 and these were subjected to genetic analysis. The more refined analysis and larger sample size using the hair showed no conclusive Spanish ancestry, they said. However, the pair stressed that their results did not disprove the considerable historic evidence that the Brittany Triangle population was linked to Spanish horses to the south. If that were the case, it meant the wild horses in the Brittany Triangle has undergone considerable transformation since these earlier times, as with many other New World horse populations where few retain any Spanish ancestry. deliberately released into the wilds,” Cothran and McCrory noted. These, they said, would remain unanswered questions. Comparing their results with the genetic profiles of 69 different horse breeds, they found that the Brittany Triangle horses of today are paired with the Canadian Horse breed within the cluster that includes the Shire, Clydesdale, Highland Pony, Eriskay Pony, Fell Pony, and Dales Pony. The origins of the herd were largely from the heavy horse types and, specifically, it appeared that the officially recognized Canadian Horse breed (or its ancestors) contributed significantly to the ancestry of the Brittany Triangle horses. This, they said, warranted further investigation. The great degree of similarity among individuals was also indicative of isolation, they added. But undoubtedly the most intriguing result related to the possibility that Yakut horses, an ancient horse of Russian heritage, also contributed to the origins of the herd. “However, this requires more study and probably more baseline samples from Eastern Russia,” they said. “We found very limited historic documentation to support the most obvious hypothesis that the Yakut horse bloodlines arrived in the remote Brittany Triangle of British Columbia from Russian fur traders along the adjacent Pacific Coast. It was, they said, important to conserve the gene pool until more was understood.